The secret behind all good health and long life of saints and yogis is that they knew the science behind breath and Pranic energy in body. As Swami Sivananda has said “A yogi measures the span of life by the number of breaths, not by the number of years”; we can now assume the role and importance of breath in our life. Breath is itself a complete science and an area to research, explore, and discover various hidden truths and secret of life. It is very strange initially to accept this truth that how breath can be the key to successful life, good health and even a ladder for spiritual growth and Samadhi? But, as we practice pranayama regularly, we open our channels and mindset to new horizons of science and wisdom behind pranic energy in our body. Our physical body is just the one aspect of our body but we have other energy body that can be seen through our inner eye. These bodies along with physical body if lacks prana level, then a person becomes diseased and is prone to poor quality of life. Through the medium of breath, we can regulate prana level in our energy bodies and can be a master of our own health and life. As everything is stored in our energy bodies such as emotional, mental, spiritual and physical trait of our own being, we can channelize these traits in right alignment through the regulation of breath and this is where the importance of pranayama comes into play. For every beginner, there are few pre requisites to begin with and then slowly escalate to advance levels. Nadi shodhana pranayama is the first requisites to enter to higher level of pranayamas. But the best part of this pranayama is that this pranayama is self sufficient pranayama and a complete practice in itself. Swami Satyananda has said “If one wants to lead a spiritual life, this pranayama is sufficient. It will steady the way to meditation and Samadhi”. And adding to it, Swami Niranjanananda Saraswati has said “Nadi shodhana is a panacea for all imbalances”. Nadi Shodhna pranayama should be practiced with right technique and under qualified yoga instructor. Become an internationally qualified yoga teacher with our 200 hrs TTC programme. Learn tow to practice nadi shodhna pranayama in our coming blogs in order to gain from it in innumerable ways. 1. Find a comfortable place. Sit in any meditation asana which is comfortable to you such as sukhasana, padmasana. 2. Keep your spine and head straight. 3. Gently close your eyes and become aware of the whole body. 4. Take your awareness to your breath. Observe the exhalation and inhalation of breath. 5. Now, make nasagra mudra (place thumb of right hand just above the right nostril and ring finger just above the left nostril whereas index and middle fingers gently on the eyebrow centre). 6. Place left hand resting on knee in chin mudra. 7. Now close the right nostril with the thumb and start the process of inhalation and exhalation with left nostril for 5 times. The breath should be taken normally and be aware of your breath. 8. Now, close the left nostril with the ring finger and start the process of inhalation and exhalation with the right nostril. 9. After completing the 5 rounds, keeping the respiration rate normal, bring your hands down and breathe through both the nostrils together for 5 times. 10. This is one complete round. Practice this one set for 5 rounds. 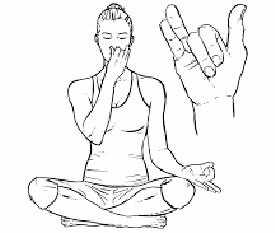 Practice this stage for at least 15 days before moving to second level of nadi shodhana pranayama. Avoid practicing this paranyama, if suffering from colds, fever or flu.